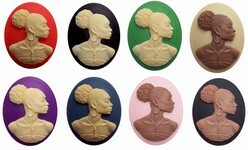 Jewelry featuring black woman and African American woman. The page contains unset cameos for making jewelry or decorating items. We also offer some of these items completed ready to be sold or given as gifts. The beautiful back woman cameo is out own design. All rights reserved. If you have further questions about the product line please contact us.